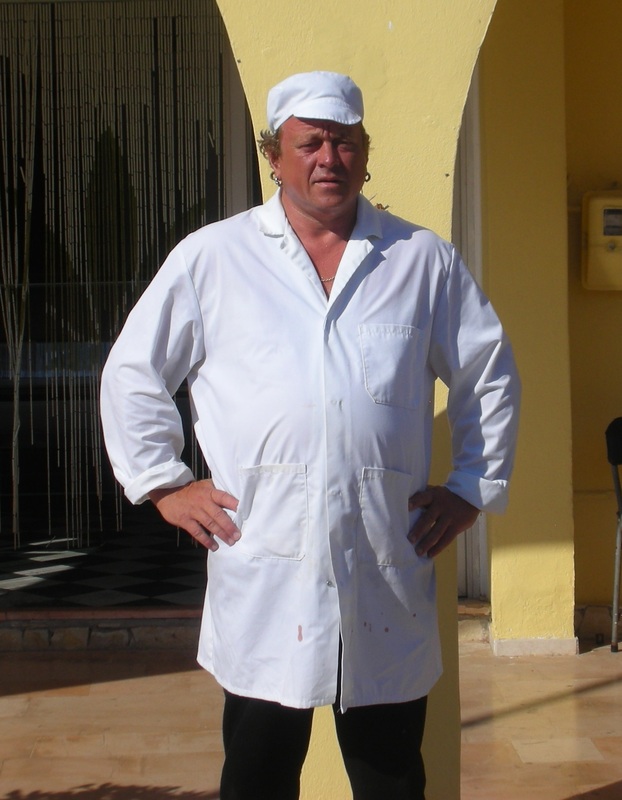 English butcher Darryl Bill outside his shop in Peritheia, Corfu. His skills thrill the British ex-pat community. Darryl Bill is an unexpected sight in the small Greek village of Peritheia, on the island of Corfu. Well over six feet tall, with curly blond hair and a gold ring in each ear, he’s an imposing guy who looks as if he could be useful in a game of rugby. He also wears the traditional long white coat and hat that was once the uniform of English butchers – a pair of sandals his only concession to the 42-degree heat of a Greek summer’s day. The air is cooler inside his butcher’s shop, a large tiled room dominated by a walk-in fridge and two long display counters. On the wall are posters showing cuts of meat, photographs of formal butchery displays from Smithfield College and old framed snapshots of family members. Darryl’s father was a butcher. So were three uncles. He started learning the trade when he was about six and was managing a high-street butcher’s shop in Basildon, Essex, when he was still in his 20s. They might have had anything between 3,500 and 4,000 customers a day back then – and they were only one of nine or ten butcher’s in the neighbourhood. Today, there is only one. People have got into the habit of buying their meat from supermarkets, where the people behind the counters are more expert at opening boxes of meat than actual butchery. Darryl left the business 19 years ago, when he was 30, and went into farm work – growing peas and then Christmas trees in Denmark, spending four winters managing a farm in the Israeli desert outside Elat. He and his wife came out to Corfu to visit friends, liked what they saw and decided to stay. A couple of years ago, he took over a restaurant in Peritheia and turned it into his butcher’s shop. There had been a butcher’s in Peritheia before. I remember buying meat there 30 years ago and how different the experience was when compared with England. Customers rarely if ever asked for a particular cut of meat. Instead, they would tell the butcher what they intended to cook and for how many people and he would cut off the relevent piece of meat for them. It was the easiest way of doing things in a culture where the repertoire of rural recipes was extremely conservative. Also, prices were the same for any part of the animal – beef cost so much a kilo whether it was flank steak or fillet. I used to point at the part of the carcase I wanted and the butcher would cut it for me. Darryl’s elderly Greek customers still shop in the old way, telling him what they’re cooking that night, but he precuts a lot of the things he sells and sets the meat out on trays in his cold counters. Now that Greece is part of the EU the wholesalers in Corfu Town have access to meat from all over Europe – Italian veal, French beef, English gammon, Greek or Dutch pork. Whole ducks come from Germany; duck breasts from France. Lambs might come from Bulgaria or Romania as well as Greece. Darryl also sells the local Corfu lambs but doesn’t think much of them. They are slaughtered too young and the meat is too sweet and bland. Legs are very small and they don’t have proper sweetbreads because the glands haven’t had time to develop. Some of the things Darryl sells are aimed squarely at the ex-patriate British community – the bacon he cures himself, the Cumberland-style sausages and especially the occasional gala pie. I haven’t had a slice of a real gala pie since I was a child but Darryl’s is a real treat. 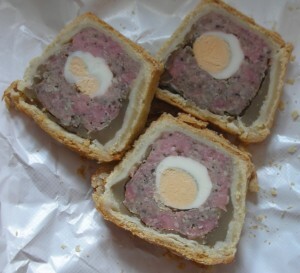 He makes it out of pork, sausage meat and ham, mustard and herbs cooked into a firm, not-too-fatty matrix in the centre of which is hard-boiled egg. The pastry is perfect – moist, not hard like commercial pork pie crust – and the layer of jelly that is poured in at the end of cooking to fill the gap between the top crust and the filling is made from pig’s trotters and sets to a firm, trembling finish. You can get Branston pickle in the Greek islands nowadays, and Coleman’s English mustard. There is also a very good new English-style real ale being brewed on Corfu, apparently by an Englishman. I am determined to investigate. Meanwhile, it is entirely possible for me to be sitting here in the middle of the Med, with Darryl’s gala pie at the end of my fork and to close my eyes and taste an English childhood.